I’m now a working mom. I sleep and shower when necessary. The only food I make is what I pump from my chest and give to my son. Everything else is either take out, or delivered right to my mouth. So recently I started thinking about this muffin top that my little son left wrapped around my waist, and Ive decided to try to do something about it. Dont get crazy, Im not dieting – just eating a little more healthy. 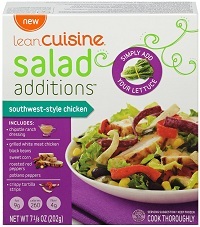 I picked up a few Lean Cuisine Salad Creations and they actually surprised me. Its a little package of stuff to sprinkle on top of your own salad leaves, and they are really good! Perfect for the lazy. Like me. I enjoy a good salad, but Im not about to buy a full bag of walnuts, or open a can of black beans or corn just to use a few spoonfuls for a salad, this is nice because you get all sorts of little extras that make a salad a success. If you have a hubby that likes to eat, buy two packs and one of those salad bags and whip it up life the professional salad creator you really are..